I was at County Hall yesterday (Monday 24th July 2017) for the Full Council meeting of Norfolk County Council. 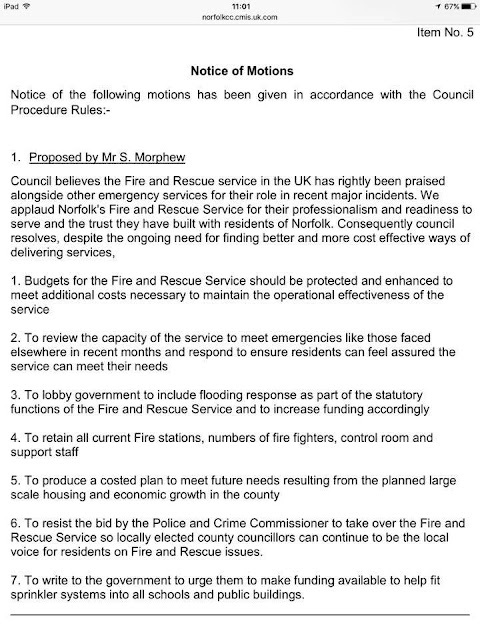 Amongst the usual Council business there was a rather timely motion about Norfolk Fire Service - full motion by Steve Morphew pictured. I was pleased to speak in support of the motion but sadly it was no carried with every Conservative Councillor, including the one representing Thetford, voting against. "Mr Chairman, I am pleased to be able to support this motion and want to particularly comment upon the section that talks about flooding, point 3. Whenever you see flooding incidents on the television or in the newspapers, whether they be coastal related flooding incidents or situations further inland, more often than not, pretty much all the time in fact, you’ll see a fire engine somewhere in the immediate vicinity and you’ll see the distinctive uniform of our fire service men and women. They can be relied upon to get in there and start tackling the problem, whether that be helping to transport people to safety or pumping water away. Certainly from a public point of view, if you were to dial 999 and you needed the fire service to assist, you'd expect them to be there. It comes as a surprise therefore to many that there is not a formal requirement for the fire service to respond to incidents of flooding as it is not regarded as a statutory duty. That should come as a particular concern to us here in Norfolk Mr Chairman. The Flood Risk Assessment report that went before the most recent ETD Committee confirmed that the flood risk from surface water run-off and groundwater is significant in our County. Over 10,000 properties at risk in Norwich alone nearly 500 in Attleborough and over 1,000 in my own town of Thetford. That’s before we even consider the risk associated with near 100 miles of coastline, the Broads, and the low lying nature of our land. A report that went before a Committee of this Council in 2011 predicted that there were over 100,000 properties in Norfolk at risk of flooding – a figure that put Norfolk in the national top ten list for flooding concerns. Nearly half of all properties, nearly 50,000 identified were at risk from tidal flooding alone. During December 2013 and at the height of the tidal surge in Great Yarmouth there were 200 breaches of Norfolk’s flood defences. We should be particularly concerned that the support needed to assist with incidents is not regarded as a statutory function and that with general fire service funding being inadequate, core functions will inevitably be prioritised. This puts an even greater risk that those non statutory functions, like dealing with flooding, will not be met. In September 2016 the then Norfolk Chief Fire Officer said in an interview with the Lynn News said that the “fire service would not be able to send crews to flooding incidents unless proper funding was forthcoming”. At the time the grim prediction was that less than a quarter of the funding needed for flood support was being made available. 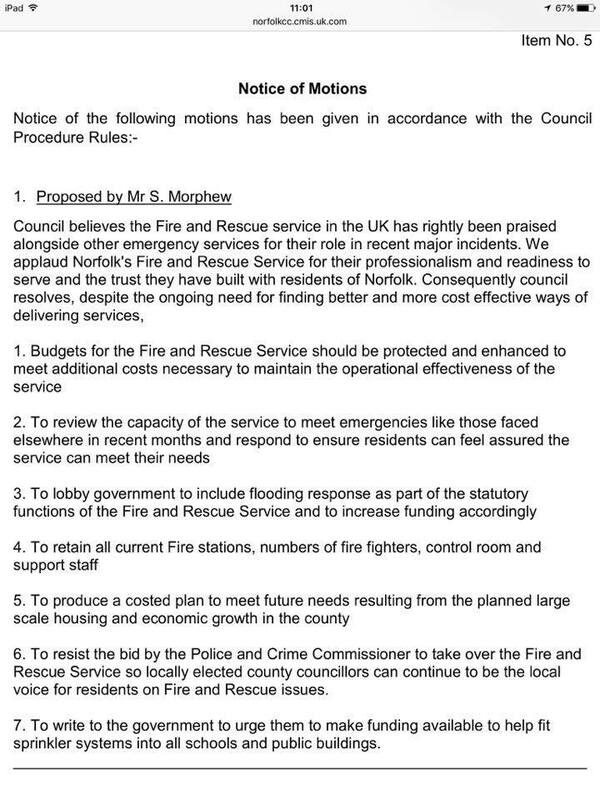 It is crucial therefore Mr Chairman that we support this motion, which includes reference to flooding so that we can continue to emphasise the importance of responses to flooding being a statutory duty and try and ensure that the funding is somewhat closer to matching the evident demand here in Norfolk. And funding that is to a greater extent equitable to the level of risk".